From the Avengers Infinity War Pop! Vinyl collection by Funko. 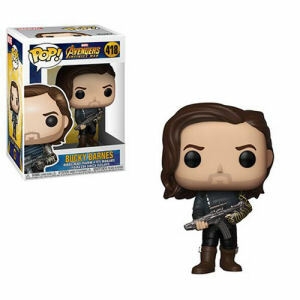 Avengers Infinity War Bucky Barnes with Weapon Pop! Vinyl Figure #418. From the Avengers Infinity War Pop! Vinyl collection by Funko. Avengers Infinity War Bucky Barnes with Weapon Pop! Vinyl Figure #418. Measures 3.75 inches high. The sylized figure comes in a displayable window box. Ages 3 and up.